Examples for gfx backend are under the imgui-examples directory. 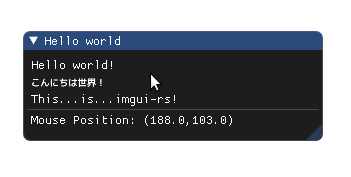 Examples for glium backend are located into the imgui-glium-examples directory. Note to Windows users: You will need to use the MSVC ABI version of the Rust compiler along with its associated dependencies to build this libary and run the examples.